This morning’s release of the first AskWoody Plus Newsletter has brought a flood of questions. I’m answering them all at CustomerSupport@AskWoody.com, but there are some recurring themes that I figure deserve a FAQ. I’ll update this list as the questions roll in. We’re taking the Windows Secrets Newsletter subscriber list, which is indexed by email address, and moving it to a much more stable email system known as MailChimp. (The homegrown Windows Secrets Newsletter system was notoriously unstable, as many of you will attest.) At the same time, we’re using a WordPress add-in to manage subscriptions. The WordPress add-in depends on AskWoody usernames. We’re sending out newsletters to both (1) folks who had Windows Secrets Newsletter accounts and (2) folks who have the new AskWoody Plus accounts. It’s dueling database time. Q: Will you honor my payment to Windows Secrets? Q: I paid by PayPal, but it said I was set up for recurring payments. PayPal and the AskWoody ordering system have a weird relationship. When you make a donation, PayPal sets up an automatic payment, pays the bill, then immediately discontinues the automatic payment. It makes no sense, but that’s how it works. If you check your PayPal account, there won’t be a recurring payment. I receive email notifications each time the auto payment is set up, when the account is charged, and when auto payment is turned off. If you’re concerned that PayPal has you on the hook for auto-renewals, write to me at CustomerSupport@AskWoody.com and tell me your PayPal account name (usually your email address). I’ll look it up just to make sure. I apologize. I’m seriously thinking about dropping PayPal support for just this reason! Q: I have an active Windows Secrets subscription, but I’m getting renewal notices. Usually that’s because the WSN data coming in isn’t complete. Any number of possible causes. The best solution, though, is to get you manually moved over to AskWoody.com, and pick up your subscription from there. Once you’ve registered here — you need an email address different from the one you use for Windows Secrets — write to me at CustomerSupport@AskWoody.com and we can make the switch manually. I hope to have an automated way to do all of that shortly. Will keep you posted. Q: When I went to register on AskWoody, I was notified that my email address was already in use. How do I get around this? The email address you use for the Windows Secrets Newsletter has been moved over to the AskWoody user database. Dueling databases. The easiest solution is to register on this site (use the Register link in the upper right corner) using any different email address you have. You’ll need to respond to a verification email sent to that different address. Once you’ve registered here, you can change your email address to anything you like. To change your email address (or password, for that matter), click on your picture in the upper right corner of this page, then click on Edit. Q: I have a lifetime Windows Secrets Newsletter subscription. How do I get it switched over? Gotcha covered. With a lifetime subscription, you’ll get the AskWoody Plus Newsletters forever, but switching over to a Plus Membership (yes, lifetime, for free) will get you all of the new benefits. It’ll go faster if you first Register on this site and set up a username. Then write to me at CustomerSupport@AskWoody.com with your AskWoody username and we can make the switch manually. Q: I created an AskWoody username that’s the same as my Windows Secrets Newsletter username — which is to say, an email address. Not a good idea. Using your email address as a username means that any time you post on AskWoody, everybody can see your email address — and that’s not good for a zillion reasons. Best bet is to register a new AskWoody username (don’t use an email address!) using any different email address you have. You’ll need to respond to a verification email sent to that different address. Once you’ve registered here, you can change your email address to anything you like. To change your email address, click on your picture in the upper right corner of this page, then click on Edit. Q: What do Windows Secrets loungers use for user name and password for accessing AskWoody? I tried my Windows Secrets user name and password, and it doesn’t work! We haven’t yet migrated the Windows Secrets Lounge over to the AskWoody Lounge. That’ll be another huge effort, with two additional dueling databases. Just to add to the fun ‘n games, the Windows Secrets Lounge passwords won’t carry over to the AskWoody site. They’re incompatible – and I wouldn’t want to be moving passwords around anyway. For now, feel free to register a new account on AskWoody. Ultimately, when we move the Windows Secrets Lounge over to AskWoody, I hope to have a relatively simple way to combine your old account with your new account. Q: Wait a sec. You’re covering CustomerSupport@AskWoody.com? Yep. I learned a long time ago that the best way to understand a system is to respond to questions and complaints. Until the dust settles, I’m tackling all of the questions personally. I really believe in this project. Why does the very first link in this topic point to reply #310011 in the autopay discussion? fixed now -thank you; however, why are all the other email links in the topic broken? Short answer: I screwed up. Long answer: I screwed up. Welcome back (front?!?!!) to WS and the WS team. Muchly looking forward to more. I’ve always used my email address as my username on this site. Not a good idea per your faq! Can username be changed? This is no biggie, if no way for me to do in my account. I know you have bigger fish to fry! Nope. You’ve got it right. Your username is KWGuy. If you had a username that looks like somebody@yahoo.com, you’d have a problem. But as long as your username doesn’t contain your email address, there’s no problem. 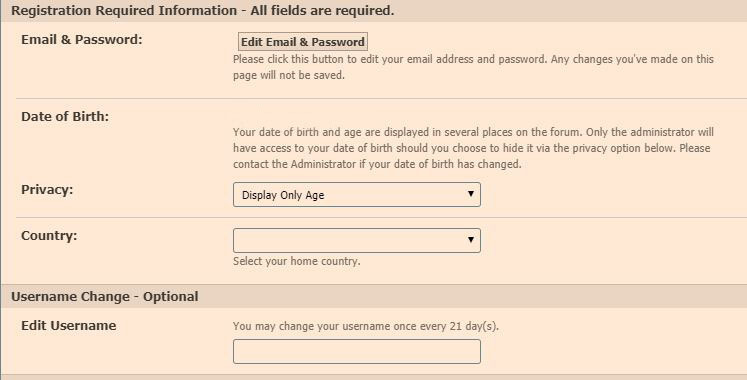 My question too… How can I access “my account” as a Plus’er, to change my e-mail address, for example? You can always change your email address (as long as it isn’t your username, which it isn’t in your case) by clicking on your avatar (picture) and then clicking Edit. The email address is way down at the bottom. Yay! Glad to see things reverting to a more appealing approach. I’d gotten to where I was not reading the newsletter because it seemed like it appealed to a different audience. Happy that you and the rest of the team are back in control. First use the Register tab (top right) to register for the Woody’s Lounge. Then use the Plus Membership area (right side panel) to donate and turn the first registration into a Plus Membership? Glad you are eager to sign up. I’m probably not the best person to answer this, but you seem to want an answer right away, and you got me… (all volunteers here). If it doesn’t work for you, you can contact CustomerSupport@AskWoody.com (as Woody knows more exactly how to make it work, and what to do if it doesn’t). Looks like your answer is “Woody Approved”. Some people have been doing their first posts in the Test forum, so they can do a little experimenting. 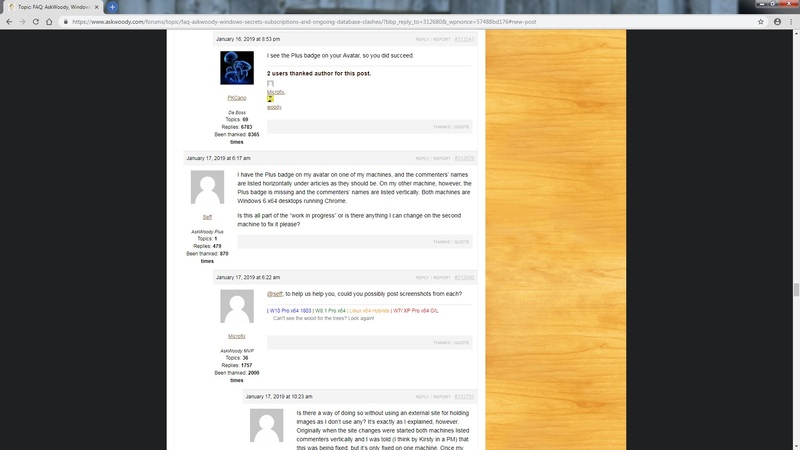 It turns out that your first post should not be done in the test forum. I apologize for any inconvenience this may have caused. Elly, thanks for the clarification. Using the Test Forum before/while registering does cause confusion. Ultimately all worked out so all is good! I’ve been confused on what exactly happening with this merger. Will the site still be “AskWoody” or will it be “Windows Secrets”, or is it going to be renamed entirely? 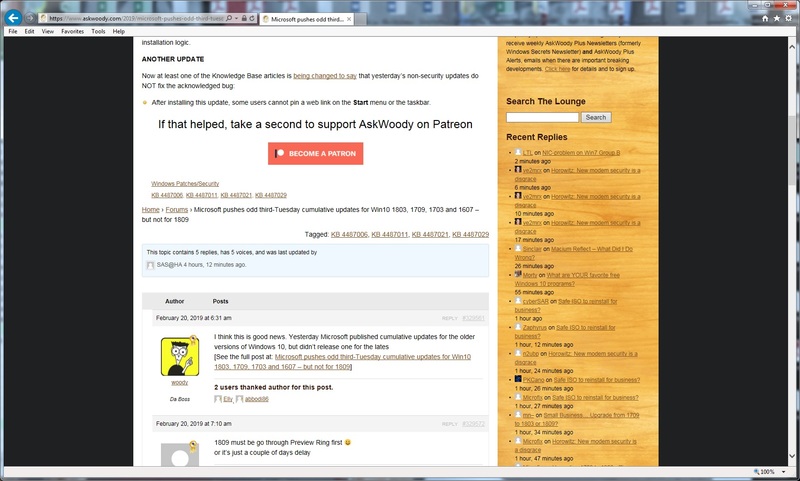 The site will remain AskWoody and much will essentially be the same for non-AskWoody Plus users. Anonymous posting will still be allowed. We are adding benefits like the Newsletter and additional Lounge access (eventually, under construction) for those who become Plus members. Besides, we’re more than Windows — and Windows Secrets was, too. but the Blue + Plus badge is still not on my avatar.. Notified Woody,waiting to see what happened.. The one thing I didn’t see covered in the FAQ was different user names in WS and AW. I imagine that there will be others in the same boat that I will be in when the transfer is done. From what I’ve gathered so far, WS user accounts will be transferred to AW and then renamed to the AW user name (saving all the previous history under the WS user name to the AW name). Is that the plan so far ?? My current plan is to modify all of the WS usernames to append “WS” to the front of the name. Then invite people to use the standard password reset techniques if they want to get into the old WS accounts. If they already have an AW account, I can manually delete and merge the old WS account into the new AW account — and, fingers crossed, everything will transfer over to the new AW account. Merging giant databases with incompatible indexes is sooooo much fun. Would it help if I tried to change my user name and password on WS to the same as it is on AW? I noticed that there is a space in profile settings to do that. No need. I’m not bringing over ANY passwords from Windows Secrets to AskWoody. I’ve been spooked by the reports of database breaches…. I mailed you a check to subscribe to your newsletter. Given the choices available to register for it, what do I do now? Now I am a Plus user! I did it through PayPal. It was quick and easy. The initial PayPal billing and email shows as a recurring payment. Yet within seconds a subsequent PayPal email shows that the recurring payment profile was cancelled. The upshot is that PayPal near instantly converts the recurring payment to a one-time billing. I am looking forward to receiving my first newsletter. In the past, I subscribed to WindowsSecrets. Is there a way I can access articles on Windows 7? If so, what user name and password should I use? We’ll be bringing the full Windows Secrets Lounge over here. It won’t be easy, but sleep is an overrated commodity. According to Windows Secrets statistics, they now have more than a million posts in nearly 200,000 threads. So here it is, my first post, although I have been reading (and learning from) AskWoody and lounge discussions for years. For years before that, I was a Windows Secrets subscriber, almost from the beginning. I let that lapse some years ago when Penton(?) took over and my voluntary annual donation was deemed insufficient. I was excited to hear about the new merger of the old gang and AskWoody, (we’re gettin’ the band back together!) that’s a + I want to be a part of! My question is: should I register here on the forum first? Or join AskWoody Plus first and then register here in the Lounge? When I join AskWoodyPlus will I create a username to use here in the Lounge or is that a separate action to be done after I am a member in good standing? Apologies if this has been answered already. I am overly cautious about such matters (just ask my wife), I simply don’t want to screw up. Sincere thanks to all of you who’ve been unknowingly helping me with Windows conundrums for years. Thank you in advance for your enquiry. When you register, your ID should not be your email address, but we will need for you to include a valid email address in the registration process if you intend to subscribe to the Newsletter and Alerts. Links to registration and the AskWoody Plus membership are in the upper right corner of the blog page. Be aware that your first post will need to be moderated. But afterward, posting will be immediate. Thank you! It is done, I am anonymous no more. Though I may still lurk. Now, how do I upload a profile picture/avatar? The way WordPress is baked, one can’t just upload a picture. Well, okay then. I have had a wordpress account with an account pic, but I signed up with them using a hotmail addy, I have never merged or authorized the actual gravatar site to use that anywhere though. I don’t think I want to do that. I joined AskWoody using my gmail. I do have a gmail avatar picture though so maybe it will show up. Guess we will see. Did you sign up at AskWoody with your gmail account? I think the emails would have to be the same. Yes, with my only gmail address. Just to add, the other day when I went to WordPress/gravatar and entered my gmail address it didn’t show my avatar until I put in woodys url and under details I put my user name. Then the avatar showed up. If I register and later change my mind, can I unregister and have my information permanently deleted including my email address to ensure it is not hacked or whatever in the future? Refer to Posts & Privacy for answers to your questions. Once you have read that, come back to us with any questions you may have then. Looks like this is the answer to my inquiry. You can request to access, correct, or delete your personal data by contacting CustomerSupport@Askwoody.com. I’m quite adamant about it, actually. I won’t store any sensitive information on this site, other than email addresses (which we need to keep various things working). If you want to spoof an email address, that’s fine with me – several Microsoft employees, among others, do exactly that. If you want me to delete your account, just drop a line to CustomerSupport@AskWoody.com. I also was a subscriber to WindowsSecrets until Penton took over. After that, it seemed this publication was directed to a very different audience. My question is will it be possible to access material on Windows 7 in the newsletters. Hopefully, I can read Woody’s, Tracey’s, Ms. Susan’s, and Fred’s articles in WindowsSecrets. For those of you interested in net neutrality, Woody and Lincoln had some excellent articles on this subject. Lincoln’s article included his recent experience with one of the few independent ISPs. Amazingly, his company installed fiber optic cables and then lowered the price. Thanks in advance for advice on accessing old articles on Windows 7 from yesteryear. We will soon be in the process of importing WS data to AskWoody. But since the structure of the two sites and the software that is/was used is quite different, it may take a while for the import to be available to our readers. At this point, it is under constructions, but I’m not sure we have the “drawings” yet, so we’ll have to wait and see how it builds out. OK so I completed first step, I think I am Registered! Tried a short post in the Testing Forum – says waiting for moderator. Saw this below per PKCano. How long does this part take before I’m legit? All of the people here, both those moderating and those providing information/answers are volunteers. None of us are subject to demands for immediate attention. We all work hard and and when we can provide the services, we do so. Posing a question multiple times in a short period of time doesn’t give us more hours in our day. Please be patient. You are one of thousands we serve. Well, not sure about how it works, but I suscribed for a year. I hope I did it right! I see the Plus badge on your Avatar, so you did succeed. I have the Plus badge on my avatar on one of my machines, and the commenters’ names are listed horizontally under articles as they should be. On my other machine, however, the Plus badge is missing and the commenters’ names are listed vertically. Both machines are Windows 6 x64 desktops running Chrome. Is this all part of the “work in progress” or is there anything I can change on the second machine to fix it please? @seff, to help us help you, could you possibly post screenshots from each? Is there a way of doing so without using an external site for holding images as I don’t use any? It’s exactly as I explained, however. Originally when the site changes were started both machines listed commenters vertically and I was told (I think by Kirsty in a PM) that this was being fixed, but it’s only fixed on one machine. Once my subscription went through, the Plus badge appeared on my avatar on that machine but not the other. If you are logged in on one machine it is not the same login on the other machine. If you haven’t logged out on the machine having problems, try doing so, clear the cache and log back in. In other words, logging in on one machine does not log you in on the other. You have to log in on both separately (in my esperience). Your badge is visible here so your ok, many thanks! There are small issues to iron out regarding the forum which will be dealt with as soon as possible. Hang in there.. Thanks both, your time is appreciated. I’ll hang on and see what happens as the dust settles, most of the time I use the correctly displaying machine anyway so I was really only interested in passing on some feedback and seeing if there was something to fix at my end on the incorrectly displaying machine (which I logged into the site on freshly today). So I’m having the same issue of the “Plus” badge not showing up in Chrome. I switched to IE and it shows up there. Does Chrome block some ad-ons or what? Edit: Nevermind…I just went back and cleared the cache and then they started appearing. Rule #1: don’t overlook the obvious. Rule #2: see rule #1. I’m running in Chrome and the flares are showing up just fine. Two possibilities occur to me. Are you on the Canary branch? And do you have any add-ons that might be getting in the way? Woody, I thought the same thing, that it might be add-ons. I went back and checked and nothing stood out. Then I was re-reading the thread and saw the “clear the cache”. That did it. Not sure why, since I had not logged on to the Forum with Chrome until after the “Plus” tag was applied. Oh well. I note some members have what I would call a footnote at the bottom of their postings. Is this accomplished via your Profile Signature block? I have gotten the new newsletter in my email. I wasn’t sure what to do next after reading through all these posts. Thank you volunteers for all your help!! Talk's cheap, takes money to buy whiskey. OK, went back to the coffee cup. Umm not seeing it. What color is it? Just above the handle – see what mine looks like above. Gold ribbon with a + in it. Sorry but no, don’t see it. Not on yours or mine (or anybodys). Woody still working on it? I will check tomorrow and see if it shows up. Ah, you beat me to it @satrow. I was just about to upload a screenshot too. We all look like ponies who’ve won gymkhanas! Got it!! Since you could see it but I couldn’t, I turned off the adblocker that was active for this site and voila, there it is. Could I remain plain OscarCP without that golden ribbon and still contribute money to Woody’s? Even if others wrongly think that I am too cheap to send money? In such a case, would I become unable to do the few things I do at Woody’s, such as reading what others post, and making occasional postings to all streams open to the now ribboned-loungers? Thanks. You most certainly can donate, using the Plus Membership link, but just untick the Subscribe to the AskWoody Plus Newsletter option. There is no compulsion for donors to subscribe! Remember to do all this from your logged-in account, to make things easier! Thks. One last question (just in case): since you’ve made clear it makes no difference, on Woody’s side, whether I take or not some of Plus “perks”, would it be possible to subscribe to the Newsletter to see what it is like, and if turns out that one is not really interested, then unsuscribe to it? I don’t see a way at present to cancel your subscription from My Account, but there is a link in each emailed newsletter, to enable you to unsubscribe, should you not feel you benefit from receiving the emails. There is also a link in the emails to update your preferences, which allows you to change your email address for the subscription – this can also be achieved in My Account too. The Home page also now has a Newsletter/Alerts tab that Woodys says will eventually only be available to Plus Members. This appears to list the Newsletters. So do Plus Members even need to have a weekly email delivered? The Newsletter button in the bar at the top should be accessible to Plus members for online perusal. When you sign up for Plus you should be able to opt out of email delivery but still access the online version. I notice you don’t have the Plus badge on your avatar yet. Short answer: No. But you might want to stay subscribed, just to be notified of Alerts as they’re sent out. I’ll mention the Alerts here on the main page when they’re out, but it takes a while to get it all posted on the site. Emailed Alerts are faster. Yes, you can remain OscarCP without the gold ribbon flare. Just email me at CustomerSupport@AskWoody.com. I’m slowly learning how the system works. It’s pretty complex, but just challenging enough. I’m very partial to my new ear tag. I had a similar thought. It either covers some of my avatars very large bald spot, or looks like I won 1st place in a 4-H club contest. I’m partial to it also. Could someone please refer me to a post or forum or explain how to enter a reference to a previous post as a link into a current post? Such as “blah blah blah as discussed here (clickable link)”. Right-click on a post number (yours is 314571) and choose Copy Link Location or Copy Link Address (depends on your browser). You get a link to that exact post. Thanks. FYI on system (Windows 7 Pro) using Internet Explorer 11 (sigh). Only Right click selection is Copy shortcut.
. That will bring up a box to paste the URL into. Click “Add Link”. and fill in “Link Text”, “here”, and add the URL. The result looks messy in the Text tab, because it shows the code, so I always click back on the Visual tab to see what it will more nearly look like when posted. Another hint to using the Text tab- if you use Copy/Paste in part of your post, do the paste into the Text tab, and excess HTML will be automatically deleted. Pasting into the Visual tab may show unintended formating code carried forward when the reply is posted. (You would see it if you go back to the Text tab, and wonder where all that came from). I’m confused. I click on ‘Posts since last visit’ and among the posts is this one, but the newest post on it is January 21st, and I’ve seen it before! There are some posts dated yesterday further up the page, just search for the string February from the top. It’s a (minor) problem with having nested posts; if someone replies to a much earlier post it won’t appear at the bottom as it would if all posts were chronological. Correct, but the posts you haven’t read while logged in will show with “New” to the left of the date. This is something to be wary of if you’re replying to one post before reading all the New-tagged posts, as reloading the topic page to reply will lose all those tags.